Dancing on A'a is another outstanding release from this unique, eclectic, and virtually-impossible-to-describe ensemble. 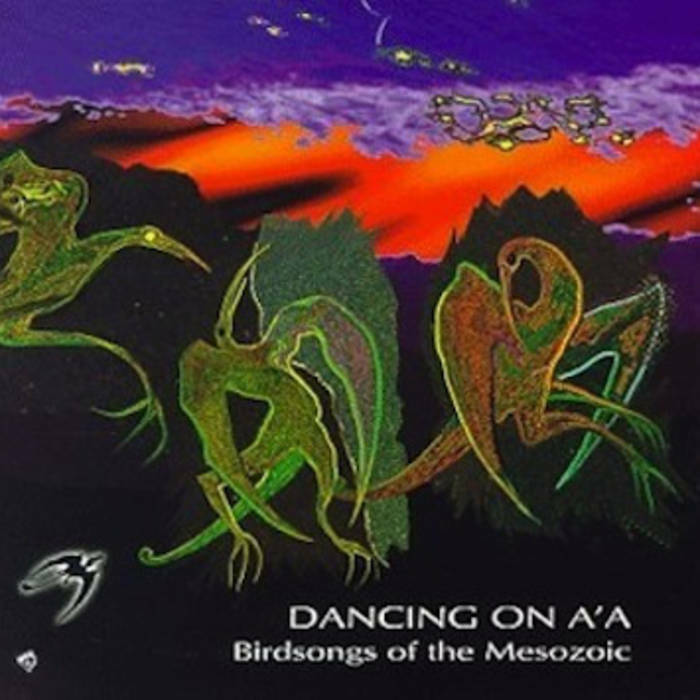 The music of Birdsongs of the Mesozoic is a bizarre and quirky mixture of avant-garde, 20th Century classical, electronic, and progressive elements. Using electronic and live percussion along with keyboards, guitar and saxophone, their sound evokes a mood and atmosphere that truly does seem to belong to another era. While Birdsongs have moved slightly away from the more overt minimalism of their earlier material, the music on Dancing on A'a is essentially a brilliant refinement of their established sound. All of the elements that have made their previous works so engaging are here in even greater abundance. Sinuous guitar and sax leads weave in and out of repetitive yet complex rhythms. Intricate rhythmic and melodic piano and synth parts help to flesh out the dense, lush sound. Moods alternate from the dark and introspective to the aggressive and unsettling. Throughout it all, though, Dancing on A'a proves to be some of Birdsongs most cohesive work to date. The writing has improved continuously over their past several albums, and here proves to be consistently solid, dynamic, and fluid, with contributions from three of the group’s four members. For anyone into the more experimental and avant-garde realms of prog, Birdsongs of the Mesozoic present some fantastically innovative and complex music, and Dancing on A'a is their best album yet. If you've never heard these guys before, what are you waiting for? What started out as an arty project composed mostly of ex-members of Boston noise-band Mission of Burma seems to have become primarily the vehicle for keyboardist/composer Erik Lindgren. Lindgren carries on on this the latest release with a completely different line-up. Ex-Burma guitarist (and former Birdsongs keyboardist) Roger Miller (no, not that Roger Miller!) contributes one composition, "Swamp," ironically also the longest track. Otherwise the album is all Lindgren and the new musicians. The compositions on Dancing on A'a are dauntingly complex, with a base in avant-garde chamber music, with touches of jazzy improvisation and rock energy, sort of like Bartók and Thelonious Monk meeting in Rock & Roll Heaven. Well, as I said, sort of. I'm not 100% sure if the music is completely composed or if there is some improvisation, but it sure sounds as though much of this was impromptu. In any case, the pieces are composed in such a way that it's fiendishly hard to tell what was improvised and what was not, not unlike National Health. But the abundant dissonances remind more of Univers Zero, Henry Cow or The Muffins. The Birdsongs aren't quite as radical as that, but fans of the aforementioned will surely not be disappointed. One could hardly term this music "commercial." Piano and sax act as the dominant instruments, backed by a bed of synthesizers. Though most of the drums are programmed, the power of the music shines through. Obviously a lot of thought went into the programming. Guitarist Michael Bierylo stays mostly in the background, providing extensive support for Ken Field's rampant sax lines and Lindgren's jagged, clustery piano chords. There is also Farfisa combo organ, for those whose tastes lean that way (knowing the readers of this magazine, probably not many). Lindgren's penchant for twisted cover versions (which his original band, the Space Negros, thrived on) seems not to have diminished over the years. This time, it's a version of Henry Mancini's evergreen Peter Gunn theme. Not quite as extreme as the Art of Noise's version, but hardly conservative, and lots of fun. So, for auditory adventurers, this is a suitable treat. It's also proof that good progressive music can come from unlikely sources. This is Birdsongs eighth release, and their third new album on Cuneiform. They continue to sport one of the most unique and unclassifiable styles, residing somewhere between rock, jazz, and neo-classical minimalism, with echoes of industrial age experimentalism. Purely instrumental, the lineup includes dual keyboards, reeds, guitar, and a combination of electronic and acoustic percussion. Their music is a labyrinthine journey through angular passages, sometimes chaotic — sometimes serene, but filled with adventure at every turn. For anyone who hasn't heard the Birdsongs before, they have never been better. As on previous releases, the better part of the compositions are written by keyboardist Erik Lindgren. The big change with this album is the addition of new guitarist Michael Bierylo, who — in addition to composing three of the album's tracks — adds a new and dynamic guitar presence within their sound, complementing the saxes of Ken Field nicely. This time out, the percussion is handled much better, with guest musicians providing acoustic drums on several of the tracks. Furthermore, the sampled electronic percussion here is much better, giving the music a more natural and less mechanical feel than on previous releases. Some high points include the dramatic "Readymen" and "Sirius the Scorching," the subtle but energized "Ptinct," and an adventurous yet concise rendition of the "Peter Gunn" theme. In all, this is by far Birdsongs' most impressive effort to date, one I'll recommend highly to the fan and newcomer alike.